I wanted to share some blessings I have received this week. First is this cute little tower of notepads, given to me by my dear friend, Betty. It was so pretty, I hated to take it apart and start using it…but I did! 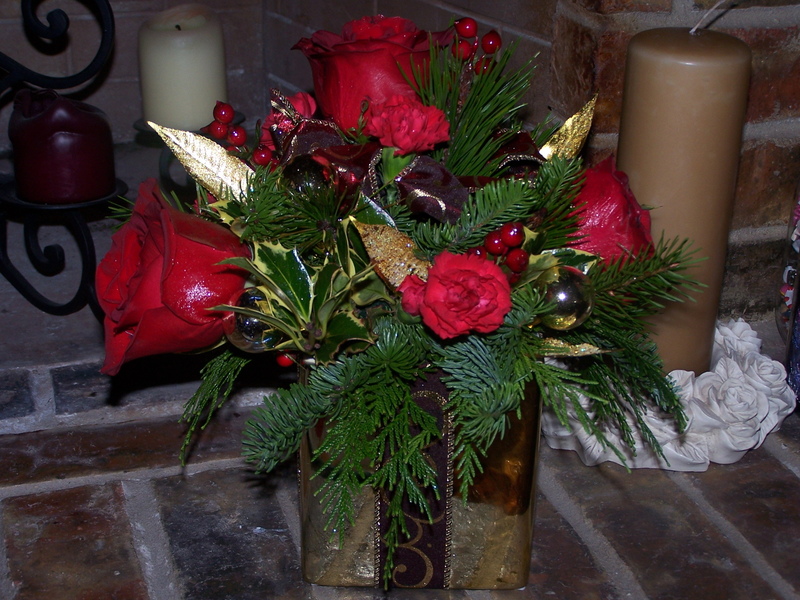 Next is this beautiful Christmas arrangement from another friend, Ramona. The flowers and greenery are real. I am really enjoying it this Christmas season. Next up is a real cutie! We did a “Dirty Santa” ornament exchange at our guild party. The first ornament I opened was this little reindeer. I loved it. Of course, it got stolen away from me, and by the time my next ornament was stolen, he was already out of play, so I couldn’t steal him back. 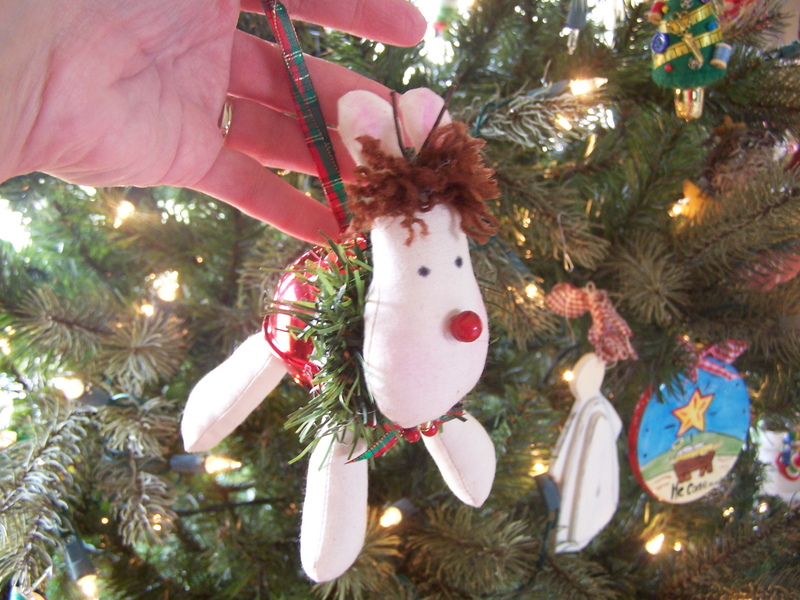 I ended up with a beautiful Jim Shore ornament, but I still did covet that little reindeer ornament. The lady that made him works out at our hospital, in the office. I dropped by there yesterday, to pay what was left on my MRI bill, and she was there and said “I have something for you. It’s in my car. I ‘ll be right back.” And she came back with this. What a complete surprise! It made me get all teary eyed. I love giving surprises, but doesn’t it make you all warm & fuzzy when someone thinks of you, too? Especially something so unexpected. Edited to add: The pattern for these is Jingle Bell Jollies, by Twice as Nice Designs. I started some much needed vacation time yesterday. I hope to get caught up around this house, and get caught up on some quilt work. I’ve gotten started on the 2nd of the memorial quilts for the Martinez family, and I’m almost finished quilting my friend Anita’s quilt. Right now, I better go eat the buffalo wings I made for lunch, before they get cold! Enjoy your Saturday! Thank you for visiting my blog and for your nice comment. Your gifts are so thoughtful. And the little ornament is sooooo sweet! 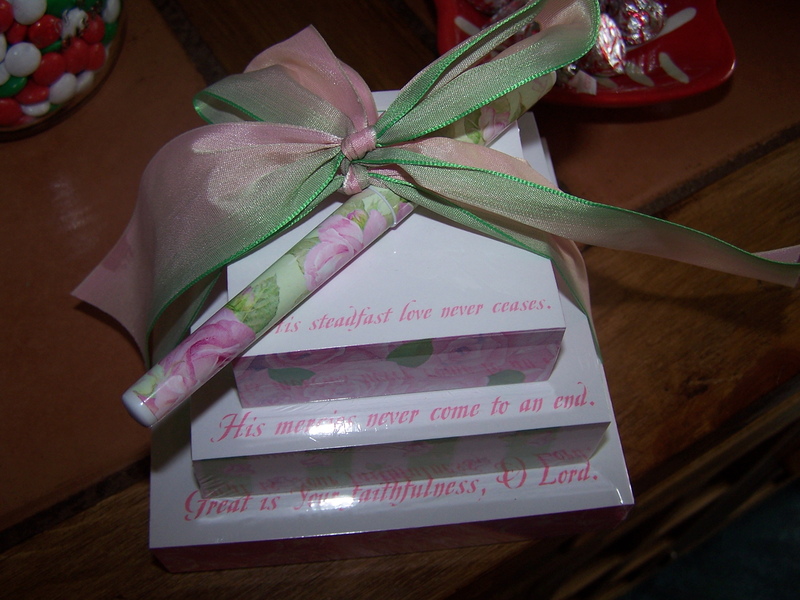 Randi, thoughtful and pretty gifts. The reindeer is cute, is it on a large jingle bell? You sure were Blessed Randi. I love them all. Have fun on your vacation. What great gifts! I also started vacation yesterday and Christmas for us is VERY low key. I’m soooo looking forward to the break! What wonderful blessings have been bestowed on one of His blessed. Question – Do buffalos really have wings???? Not if y’all keep eating them! Enjoy. 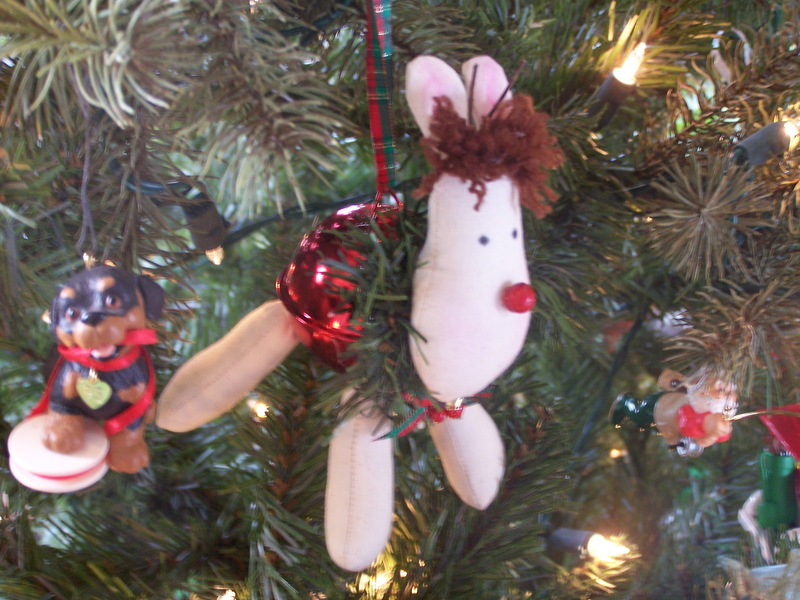 I can’t describe the images conjured up by the term “Dirty Santa Ornament Exchange.” The reindeer ornament is adorable, but for the life of me, I couldn’t see what was so “dirty” about him. (Don’t worry, I got the concept of the game…eventually. 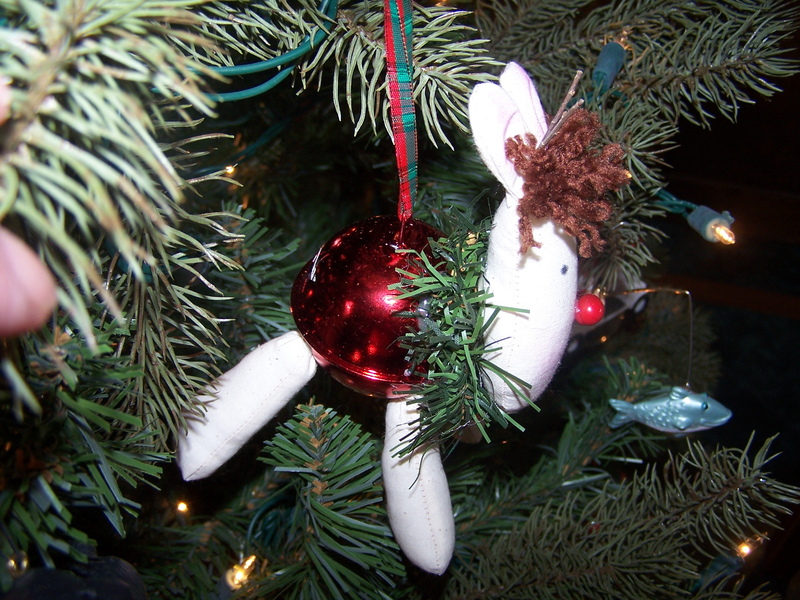 One year for Christmas, I gave my brother a pair of “fallen angel” ornaments, both anatomically correct and scantily clad. So, you can see where my imagination went.